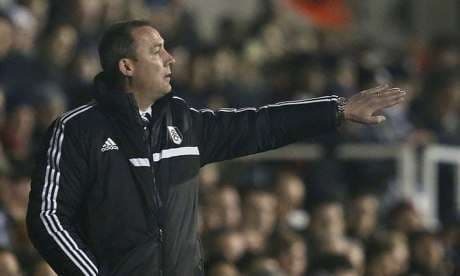 If Fulham manager Rene Meulensteen has any sense then he will approach his English Premier League struggler’s FA Cup fourth round replay against Sheffield United as a terrific opportunity to boost morale throughout the Cottagers camp. Neither Fulham nor Sheffield United, fourth from the bottom of the English League One ladder seven seasons following its relegation from the English Premier League, has won any of its last four games so confidence is in very short supply. While acknowledging that Fulham’s life as an English Premier League may end in a few months from now, the Cottagers have a top-flight quality roster and they have the same number of league matches as Sheffield United even though the Blades have participated in three more games two divisions lower. Every league match for Fulham and Sheffield United between now and the end of their respective terms is a big one but one could argue that the Blades have the more immediate massive game, with fellow English League One relegation candidate Shrewsbury visiting Bramall Lane on Saturday. Meulensteen and his Fulham team should see Sheffield United rocking up at Craven Cottage as a chance to put the debacle of Southampton’s all-too-easy English Premier League away victory behind them with a clear-cut home win over poor opposition to qualify for the English FA Cup last 16. And, with only two of England’s big four guaranteed to make the quarter-finals, there is an opportunity for sides such as Fulham to go all the way in the old knockout tournament. Bet365 is taking a chance in offering odds of 1.67 about Fulham beating Sheffield United, a team ranked 46 places below it on the English football pyramid, at home. Those odds would not be out of order if Sheffield United was playing away to Fulham’s local rival, Brentford. The Coppa Italia semi-finals kick off and Roma, unbeaten at home this season, appeals at odds of 2.00 with Betfred to gain a priceless first-leg advantage over Napoli. Roma has won 11 and drawn two of its 13 home matches across all competitions, including a 2-0 Italian Serie A defeat of Napoli, 11 clean sheets and ten wins to nil. Napoli played the last 20 minutes of its league loss at Roma with ten men because veteran defender Paolo Cannavaro saw red because of the incident that led to the Wolves receiving the penalty kick that Miralem Pjanic converted to put the game to bed. Napoli’s Italian Serie A away record is the third best in the division but one cannot escape Roma’s impressive home numbers, including its 2-0 victory in the corresponding league fixture. Odds of 2.00 are more than acceptable. Finally, Real Madrid and Atletico Madrid put their Spanish Primera Division title drives on hold to contest the Copa del Rey semi-finals, starting with the first leg at the Santiago Bernabeu home of the Meringues. Real Madrid is a shade of odds on to get the jump on Atletico Madrid but, more interestingly, some bookmakers are offering odds greater than evens about under two and a half goals. Atletico Madrid’s success this term, including its first Santiago Bernabeu triumph since 1999, has been built on its impressive defence that gives nothing away for free, either at home or on the road. Atletico Madrid has conceded only 14 goals in its 22 Spanish Primera Division games and, if one factors in all the cup matches that it has played, it has leaked just 21 goals in its 36 games. That is impressive. There is no secret about how Atletico Madrid is going to tackle its Spanish Copa del Rey semi-final first leg versus Real Madrid – Diego Simeone’s side will defend deep, concede possession and look to hit their opponent on the break. Real Madrid will have to work hard to break down its city rival and, therefore, it is surprising to see many bookmakers put up odds-against prices about under two and a half goals. William Hill is offering odds of 2.15 that Real Madrid and Atletico Madrid combine for under two and a half goals, which is exactly what they did in the corresponding Spanish Primera Division fixture that the Mattressmen won 1-0.